When I was first experimenting with makeup, MUA was one of my go-to brands. It offers impressive quality for a fraction of the price of other brands. Their core range is £1 per item, with their most expensive item being £4. MUA is a great brand for if you're starting out with makeup and want to try a few different things. You can get your hands on a decent kohl liner, liquid liner and a gel liner for around £5. So you have good opportunity to try out different types of products to see what suits you! Anyway, on to this review. 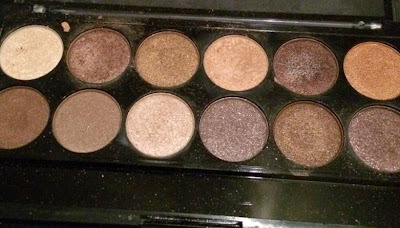 This is a 12 shade eyeshadow palette full of neutrals - and all the colours are very highly pigmented. Excuse the state of my palette, it's been travelling with me a lot and its got a bit bashed about. I think this palette is great for everyday looks. I like to wear eyeshadow to work, and these are great. As the palette is only £4, I don't feel wasteful wearing these daily. I wouldn't compare the quality of these shades to Mac or Urban Decay as they're very soft and some are a less pigmented than others. They are great for everyday use though and they are not to be sniffed at for £4. The palette is kinda flimsy and some colours are better than others, but if you're starting out with makeup or want some eyeshadow for work then go for these!